Nephronophthisis is a recessive cystic renal disease that leads to end-stage renal failure in the first two decades of life. Twenty-five percent of nephronophthisis cases are caused by large homozygous deletions of NPHP1, but six genes responsible for nephronophthisis have been identified. Because oligogenic inheritance has been described for the related Bardet-Biedl syndrome, we evaluated whether mutations in more than one gene may also be detected in cases of nephronophthisis. Because the nephrocystins 1 to 4 are known to interact, we examined patients with nephronophthisis from 94 different families and sequenced all exons of the NPHP1, NPHP2, NPHP3, and NPHP4 genes. In our previous studies involving 44 families, we detected two mutations in one of the NPHP1–4 genes. Here, we detected in six families two mutations in either NPHP1, NPHP3, or NPHP4, and identified a third mutation in one of the other NPHP genes. Furthermore, we found possible digenic disease by detecting one individual who carried one mutation in NPHP2 and a second mutation in NPHP3. Finally, we detected the presence of a single mutation in nine families, suggesting that the second recessive mutation may be in another as yet unidentified NPHP gene. Our findings suggest that oligogenicity may occur in cases of nephronophthisis. By definition, in monogenic disorders, mutations in one gene are sufficient to cause disease.16 In the autosomal recessive disorder Bardet-Biedl syndrome (BBS; MIM209900), which shares clinical features with NPHP, mutations in more than one gene have been detected, suggesting the presence of “oligogenicity.”17,18 From more than 300 publications on NPHP occurring in siblings, the disease was assumed to be autosomal recessive. Because NPHP and BBS are phenotypically related, we examined whether oligogenicity can also be observed in NPHP by examining 94 patients for homozygous NPHP1 deletions and mutations in all exons of NPHP1, 2, 3, and 4. Here we demonstrate oligogenicity in patients with NPHP and suggest that in some instances, a potential third mutation might exert an epistatic effect on the phenotype by modifying the age of onset and/or the severity of the clinical phenotype. In six families with NPHP, we were able to identify three mutations in two NPHP genes (Table 1, Figure 1). The three mutations were distributed among the various NPHP genes as shown in Table 1. Oligogenic inheritance in individuals with NPHP. (A) In pedigree F9, both affected individuals II-1 and II-2 have three mutations: Homozygous deletions in NPHP1 and one heterozygous mutation in NPHP3 (R397C). (B) Individual F194 II-1 has a homozygous R586X in NPHP1 combined with a heterozygous A52T mutation in NPHP3. (C) Individual F906 II-2 has one homozygous deletion in NPHP1 and one heterozygous mutation in NPHP3 (N386S). (D) In pedigree F1114, each affected individual has inherited one homozygous deletion in NPHP1. In addition, the earlier affected child with earlier onset of NPHP (II-1) carries a third (paternal) heterozygous mutation in NPHP4 (P511L). (E) Individual A11 II-1 has two heterozygous mutations in NPHP3 (fsX148 and IVS24–1G→C) and an additional heterozygous NPHP4 mutation (fsX1144). (F) In pedigree F24, both affected individuals have two heterozygous mutations in NPHP4 (IVS16–1G→C and G754R), and individual II-1 carries an additional heterozygous mutation in NPHP3 (T121R). Squares denote males, circles denote females. Filled symbols indicate affected status. Sequences of the mutated nucleotide(s) are shown. Two mutations in NPHP1 and one in NPHP3 were detected in three kindreds. The siblings F9 II-1 and F9 II-2 showed a homozygous deletion in NPHP1 and a heterozygous missense mutation C1189T (R397C) in NPHP3, which was inherited from the father. The amino acid residue R397 is conserved in evolution, including Danio rerio (Table 1, Figure 1). The individual F194 II-1 showed a homozygous C1756T (R586X) nonsense mutation in NPHP1 and a heterozygous missense mutation G154A (A52T) in NPHP3. Segregation could not be assessed because of the lack of parental DNA (Table 1, Figure 1). The C1756T (R586X) mutation was recently published in three Italian individuals.19 Individual F906 II-2 showed a homozygous deletion in NPHP1 and a heterozygous missense mutation A1157G (N386S) in NPHP3. The amino acid residue N386 is conserved in evolution including Xenopus laevis (Table 1, Figure 1). Two mutations in NPHP1 and one in NPHP4 were detected in one family: Both siblings F1114 II-1 and F1114 II-2 showed a homozygous deletion in NPHP1. However, only individual F1114 II-1 showed a heterozygous missense mutation C1532T (P511L) in NPHP4. The other affected sibling, F1114 II-2, who also showed the homozygous deletion in NPHP1, did not carry the missense mutation in NPHP4. Both children presented with retinitis pigmentosa. It is interesting that sibling F1114 II-1 developed ESRD at the earlier age of 9 yr, whereas his sister, F1114 II-2, entered ESRD later at age 17 yr (Table 1, Figure 1). Combined mutations in NPHP3 and NPHP4 were found in two kindreds: Individual A11 II-1 showed a heterozygous frameshift mutation 435–438delAAGT (fsX148) inherited from his mother together with a heterozygous IVS24–1G→C obligatory splice site mutation in NPHP3 inherited from his father. In addition, there was a heterozygous frameshift mutation 3364delACTG (fsX1144) in NPHP4, inherited from his father, resulting in a total of three putative loss-of-function mutations. This patient developed early-onset ESRD with liver disease (characterized by increased γ GT and transaminases) as a result of congenital hepatic fibrosis when he was 3.5 yr of age. Renal ultrasound revealed renal microcysts. He had no retinal or neurologic involvement (normal electroretinogram at 8 yr). Both siblings, F24 II-1 and F24 II-2, showed a heterozygous IVS16–1G→C obligatory splice site mutation, inherited from the mother, and another heterozygous missense mutation G2260A (G754R) in NPHP4, inherited from the father. In addition, individual F24 II-1 showed a heterozygous C362G (T121R) mutation in NPHP3, inherited from the maternal allele, which was absent from the other affected sibling, F24 II-2 (Table 1, Figure 1). None of the mutations described was found in 192 ethnically matched control chromosomes. Three of these families (F194 II-1, F906 II-2, and F1114 II-1 and II-2) presented with retinitis pigmentosa (Table 1). Six individuals from four kindreds presented with a homozygous deletion or mutation in NPHP1. Four of them showed a combination of a homozygous NPHP1 gene deletion/mutation with a heterozygous NPHP3 mutation (F9 II-1 and II-2, F194 II-1, and F906 II-2). It is interesting that F194 II-1 presented with the identical nonpolar-to-polar amino acid residue exchange (A52T) of NPHP3 previously described as a pathogenic mutation found in F440 II-2 (see Supplementary Table 3).7 The nonpolar-to-polar amino acid exchange N386S in NPHP3 identified in F906 II-2 was also detected in patient F16 II-3 with SLS, who carried only one heterozygous mutation in all four genes (see Supplementary Table 3). All patients are offspring from nonconsanguineous marriages. We detected two heterozygous mutations in two different NPHP genes in kindred F281, who carried a missense mutation G1948C (A650P) in NPHP2 and C3662T (A1221V) in NPHP3 for patient F281 II-1 (Supplementary Table 2). The NPHP2 mutation of F281 II-1 is identical with the heterozygous mutation found in F443 II-1.20 None of these mutations was found in 192 ethnically matched control chromosomes. In nine families, we detected only one single heterozygous mutation in one of the NPHP1 through 4 genes (Supplementary Table 3). Individuals presented with a variety of extrarenal manifestations, such as retinitis pigmentosa (F16 II-1 and II-3, F440 II-1 and II-2, and F319 II-1 and II-2), three with Joubert syndrome (F897 II-3, F394 II-7, and F700 II-6), one with ulcerative colitis (F443 II-1 and II-4), two with liver fibrosis (F390 II-1 and F443 II-1), one with biliary atresia (F616 II-2), one with Jeune syndrome (F440 II-1 and II-2), one with Cogan syndrome (F800 II-1), and one with cor triatum sinister and pulmonary veins dysplasia (F244 II-5). In 50 of the 94 families with NPHP examined for the NPHP1 through 4 genes, we did not find any mutations. NPHP is considered an autosomal recessive disease. Recent studies using positional cloning have identified six genes responsible for NPHP.1,5–11 The gene products of the NPHP2 through 4 genes, nephrocystin-2/inversin, nephrocystin-3, and nephrocystin-4, have been shown to interact with nephrocystin-1.6,7,9 Recently, evidence for oligogenic inheritance was shown in BBS, which demonstrates phenotypic overlap with NPHP.3 In some of the families with BBS the third mutation coincided with a marked increase in disease severity of specific phenotypic features.21 Moreover, a potential epistatic effect of NPHP6 and AHI1 mutations in patients with Joubert syndrome and NPHP1 mutations was recently described.22 We therefore examined whether oligogenic inheritance would also be present in NPHP. Here we present evidence for oligogenicity in NPHP1 through 4 by detecting two mutations in one of the NPHP genes in combination with a third mutation in another NPHP gene in six different families with NPHP (Table 1). It is interesting that the heterozygous mutations A52T and N386S in NPHP3 have been observed each in two separate SLS pedigrees (F194 and F440, and F906 and F16, respectively) but not in healthy control subjects. Olbrich et al.7 also described one patient who had SLS with a single mutation N386S in NPHP3. Olbrich et al. suggested that the unidentified second mutation may be located in a noncoding regulatory region or within an intron of NPHP37; however, it is very suspicious that this mutation was found in three different patients with NPHP and retinitis pigmentosa. Therefore, it may be possible that this mutation modifies the clinical phenotype regarding retinitis pigmentosa. The unidentified second mutations may be present in another, yet-unidentified NPHP gene. It is of note that in the report of Olbrich et al.,7 three families have two mutations in NPHP3, whereas six families have only one mutation.7 The high number of heterozygous single mutations found in NPHP3 also supports that there could be a digenic or oligogenic variant of NPHP. As far as NPHP2 is concerned, individual F281 II-1 showed two mutations, one heterozygous mutation in NPHP2 (A650P) and one heterozygous mutation in NPHP3 (A1221V; Supplementary Table 2). In addition, the heterozygous mutation A650P in NPHP2 was detected in another individual (F443 II-1) but not in 192 healthy control chromosomes. Combinations of heterozygous mutations may also be envisioned as causing an NPHP phenotype, because it is known that many of these proteins interact. However, it may also be possible that this patient has two additional mutations in a yet-unknown NPHP gene. The notion that there exist many more unknown NPHP genes is further supported by the fact that in 359 of 515 children with NPHP, the causative gene is still unknown. 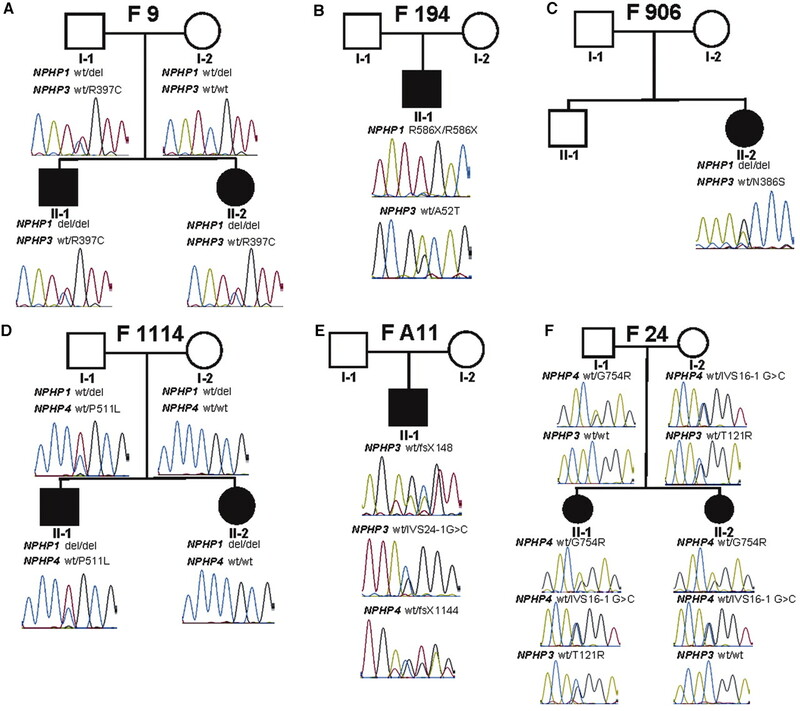 We identified nine families with only a single mutation in one of the NPHP1 through 4 genes. Seven of these nine individuals show extrarenal phenotypes (Supplementary Table 3). It is interesting that the siblings in F16 show a significantly different clinical course: F16 II-3 with a single heterozygous NPHP3 mutation showed ESRD at the age of 11, whereas her sister (F16 II-1) did not reveal this mutation and showed only mild renal impairment at the age of 20 yr. It is tempting to speculate that onset of renal failure may be earlier in F16 II-3 as a result of the presence of this potentially pathogenic third mutation, assuming that the other causative gene has not yet been identified. Likewise, the existence of several different mutant alleles could explain the intrafamilial variability of our NPHP patients F1114 and F24. Intrafamilial variability may also be caused by modifier genes, which may be responsible for the occurrence of extrarenal manifestations in NPHP.8 This situation would be similar to oligogenicity. The presence of modifier genes is supported by genetic modifications in the mouse model of NPHP3 (pcy mice).26 The identification of modifying loci was already published for pcy, cpk, jck, and bpk mouse models of human polycystic kidney disease. Modifying genes have been proposed to explain at least the diversity of polycystic kidney disease phenotypes observed in humans and animal models.26,27 Woo et al.27 defined the pcy/pcy mice as a mouse model for polycystic kidney disease. The loci MOP1 and MOP2 are described as major modifier loci that modulate the onset to ESRD. Further studies suggest that MOP1 in mice, which also strongly modulates the progression of polycystic kidney disease in cpk/cpk mice,26 corresponds to the NPHP2 (inversin) locus in human. MOP2 corresponds to the NPHP3 locus in humans. These data again suggest that mutations at more than one locus may be present in at least some patients with NPHP and that there are still unidentified NPHP genes. The findings of many single mutations in our study and the already described single mutations in NPHP37 also indicate further genetic locus heterogeneity for NPHP. After informed consent, we obtained 94 blood samples and pedigrees from patients with NPHP and their parents. All patients had the diagnosis of NPHP on the basis of the following criteria: (1) A clinical history consistent with NPHP, including development of ESRD, a history of polyuria, polydipsia, and anemia; (2) a renal ultrasound finding consistent with NPHP; and (3) in a subset of patients, a kidney biopsy result consistent with NPHP. In 44 families, we had already detected mutations in any one of the four NPHP1 through 4 genes.1,6–8 The genes involved and the clinical characteristics including the extrarenal symptoms of the previously described mutations are shown in Supplementary Table 1.1. Supplementary Table 1.2 lists the clinical characteristics of the 50 patients without a known mutation. The study was approved by the ethics committee (institutional review board) of the University of Michigan and in adherence to the Declaration of Helsinki. Genomic DNA was extracted from blood samples using the QIAGEN (Valencia, CA) Blood & Cell Culture DNA kit according to the manufacturer's instructions. Direct sequencing was performed for all 94 individuals in the NPHP1 through 4 genes using the dideoxy chain termination method on an ABI Prism 3700 DNA Analyzer (Applied Biosystems, Foster City, CA). Sequences were evaluated with the Sequencher (Gene Codes, Ann Arbor, MI) software. Primers flanking 20 exons of the NPHP1 gene, 16 exons of the NPHP2 gene (inversin), 27 exons of the NPHP3 gene, and 30 exons of the NPHP4 gene were derived from genomic sequence (GenBank accession nos. NT_034485, NT_008470, NT_005612, and NT_028054). Primer sequences are available from the authors. For segregation analyses and screening of healthy controls for mutations, allele-specific digests, denaturing HPLC (WAVE; Transgenomics, Omaha, NE), or direct sequencing was used. F.H. is the Frederick G.L. Huetwell Professor and a Doris Duke Distinguished Clinical Scientist. He is also supported by grants from the National Institutes of Health (DK064614, DK069274, and DK068306). M.T.F.W. was supported by grants from the Koeln Fortune Program Faculty of Medicine, University of Cologne (184/2004), the German Kidney Fund (Deutsche Nierenstiftung), and the German Research Foundation (DFG WO 1229/2-1). J.F.O. was supported by a grant from the National Institutes of Health (IK08-DK071108-01A1). We thank the patients and their families for participation in the study. We thank R.H. Lyons for excellent nucleotide sequencing.